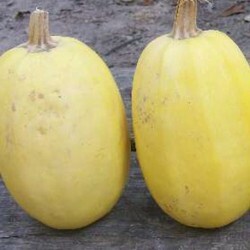 Cornell's bush delicata winter squash produces small, elongated fruits. An old, heirloom variety. The plants spread onbly about a metre. 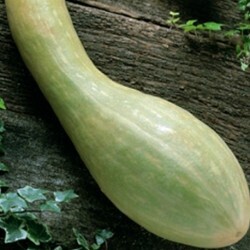 The skin of the squash is pale green with dark stripes, stores for 3-4 months during the autumn-winter. The rich, orange flesh has really sweet taste and smooth texture. The compact bush habit makes this variety a good choice for small gardens and large pots. Sow the delicata squash seeds from late March through April under glass for growing in the greenhouse, or late April through May to transplant outdoors. 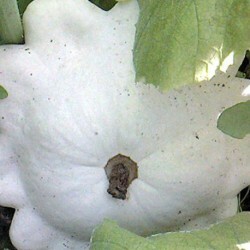 Winter squash seeds can also be sown direct outdoors, in a finely prepared bed, from late May. Sow the winter squash seeds 2 cm deep in 7.5 cm pots of good compost or in seed cells, 1-2 seeds per pot/cell, so you can save the stronger seedling. Transplant the squash seedlings into bigger pots when large enough to handle. Place in a propagator before transplanting outside. 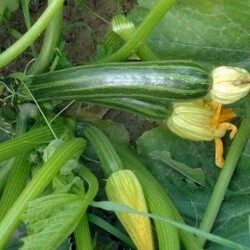 Leave 60-80 cm between the squash plants. Prefer rich and well drained soil. The fruits can be left on the vine up to until November and stored in a frost free, well ventilated place for up to 5 months.